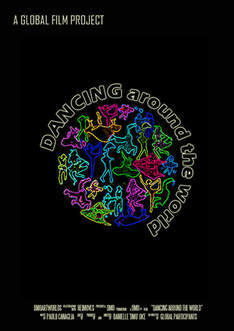 ​A screening of "Dancing Around The World" for National Parkinson's Day! "Dancing Around The World" is a crowdsourced dance/drama documentary film comprising an arranged series of twenty videos selected from public submissions from five continents, each using the unifying language of dance movement to tell their story. The project features a submission from DanceWell Italy, who use dance to help those with Parkinson's. Monica brings ReiMoves to Montecchio Maggiore at the guest dance space of the Associazione Cultura etradanzae20, delivering an open workshop to teens and adults that introduces participants to the ReiMoves movement practice. ​A screening of the global film project "Dancing Around The World"
"Dancing Around The World" is a crowdsourced dance/drama documentary film comprising an arranged series of twenty videos selected from public submissions from five continents, each using the unifying language of dance movement to tell their story. The project, conceived to remind people of that which unites us during a time of misguided separatism, was created by DMo in association with ReiMoves. The film will be screening at the Casa della Cultura Italo Calvino in Bologna. "Dancing Around The World" is a crowdsourced dance/drama documentary film comprising an arranged series of twenty videos selected from public submissions from five continents, each using the unifying language of dance movement to tell their story. The project, conceived to remind people of that which unites us during a time when great separation was being caused in the world, was created by DMo in association with ReiMoves. The film's premiere screening will take place this summer as part of B.Motion, at the Opera Estate Festival Veneto 38. It will screen for 5 consecutive days as a looping projection. 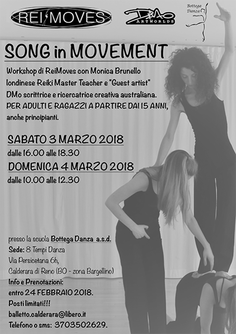 Monica brings ReiMoves to Bassano, delivering an open workshop that introduces participants to the ReiMoves movement practice. Monica is assisted by French dancer Sara Augieras. 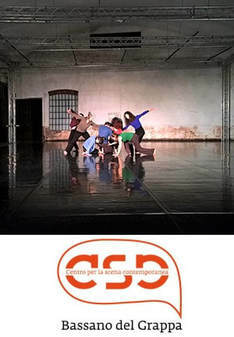 Joining the workshop are also dancers Monica worked with during her one-week residency at CSC (Centro per la Scena Contemporanea). Day one will see Monica introducing participants to the ReiMoves movement practice. Day two will be a collaboration with artist/writer DMo, combining songwriting structure with emotional material uncovered from ReiMoves exercises, to create a song in movement. 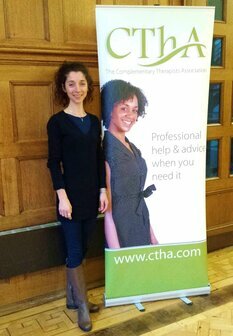 Monica will be guest speaker at the next CThA gathering in Putney Bridge, sharing insights into her movement practice ReiMoves. Come along to hear more about the practice and try out a few exercises. Monica will be returning to the White Rainbow Gallery to complete the contemporary dance composition with Juri Nishi and fellow dancers, in response to the work of Japanese artist Shigeo Anzaï, this time with a thematic focus on Anzaï’s portraiture. The Shigeo Anzaï solo exhibition Index II will be running from 18 May to 18 June, 2016. Monica will perform in the duet piece Mugen / 夢幻 by Juri Nishi with Swedish dancer Madeleine Jonsson. The performance is part of the V&A Late themed on Japan, featuring a selection of Japanese contemporary artists, composers' installations and performances throughout the V&A. Mugen / 夢幻 is an enquiry into the roots of the Japanese identity in relation to the form of Kimonos, their sense of beauty and belief in Shintoism. The performance will be accompanied by live sound composition of birds, voices, Kora and percussion. 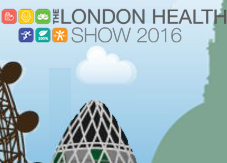 Monica is teaming up again with the Good JuJu Bar to offer Reiki at the London Health Show 2016 held at Olympia in the new year. The Good Juju Bar will be exhibiting their range of Raw food Detox Plans and Holistic Detox retreats. Come and visit them at stand J38 for some sample dishes and Reiki sessions with Monica. 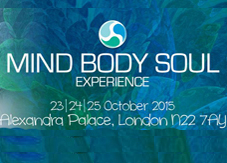 Monica is teaming up with regular collaborator the Good JuJu Bar to offer Reiki and ReiMoves at the Mind Body Soul Experience at Alexandra Palace this year. The Good Juju Bar offers a range of Raw food Detox Plans and Holistic Detox retreats. As part of the MBS Experience they will be giving samples of their dishes, along with Reiki sessions and the possibility to learn more about ReiMoves. 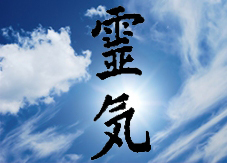 Join Reiki Master Monica Brunello for an opportunity to experience the power of Reiki first hand with these special 20-minute taster sessions. Monica will be sharing the holistic treatment, that promotes a blissful state of relaxation and brings relief from the hectic pace of daily life. This is a great opportunity to give Reiki a try if you never have before, or just come along for a booster session. Reiki is a fully-clothed treatment so please dress comfortably. In this special ReiMoves workshop led by Monica, the focus will be on learning how to cut energetic cords to cleanse your energetic body, ridding yourself of unwanted negative energy drains and creating closer bonds with your loved ones. ﻿Take an inner walk through your emotions with Monica Brunello as she introduces you to the exercises and techniques of the movement practice ReiMoves. 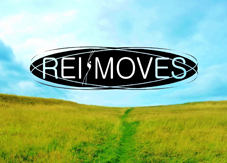 ReiMoves is a practice that forms a path to self through release-based movement infused with the energy healing principles of Reiki. It focuses on the expression of both internal and external movement of energy through movement-based energy work, partner work, visualization, and specific ReiMoves exercises such as Transformations. ReiMoves workshops help tune people into their bodies and its movement, gaining a deeper understanding of their entire being. In this particular workshop, emphasis will be placed on taking an inner journey to know your emotional self and to help release any held onto emotions that drain your energy unnecessarily. This practice is suitable for all fitness levels.